Russian lessons in Peterborough or Online – worldwide! There are around 300 million Russian speakers in the world making it the most widely spoken Slavic language. Russian is also spoken in the Ukraine, Belarus and Kazakhstan so if you know some Russian you are likely to be understood anywhere from Riga in Latvia to Belgrade in Serbia. If you know Russian it will help you learn other languages such as; Polish, Czech, Slovak, Bulgarian, Croatian, Serbian, Bosnian or Slovene. • To learn a few basic phrases before a holiday in Russia. • To do business in Russia. • To enhance a cultural interest in Russian history, literature or ballet. • To communicate with Russian friends, family or colleagues. • As a personal challenge – Russian is a unique language to learn! Read our blog post, “Why learn Russian?” to find out why it really is an important language to learn. How hard is Russian to learn? Although most people think that Russian is a difficult language to learn, the good news is that it only has three tenses and the word order is more straightforward. 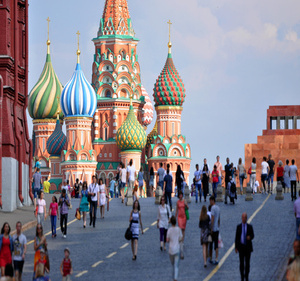 We are proud to be able to offer local face-to-face Russian lessons with a fully qualified and experienced Russian tutor as well as online Russian tuition over Skype. Our Russian tutor is a native Russian speaker who is also fluent in English. She is a gifted teacher who loves sharing her love of the language and helping others learn it to communicate effectively. With her excellent interpersonal skills along with a good sense of humour she puts her clients at ease straight away making it the ideal learning environment to progress quickly and easily. If you would like to find out more about learning Russian or to book a lesson contact us today on (01733) 573467 or 07870 699404. "I was a mature casual learner, wanting to understand the basics of the Russian language for a forthcoming vacation. I approached Zarema in August 2013, who accepted the challenge of tutoring me for 31/2 months. Initially I wondered what I had let myself in for, as I found it a very difficult language to grasp. Zarema's approach was firm but friendly, motivational and most importantly the learning materials were adapted to be relevant to my needs and capability for such a short period of time for learning. Thanks to Zarema, my vacation was a huge success, and I was praised for the effort applied and knowledge of Russian words and phrases that I obtained."